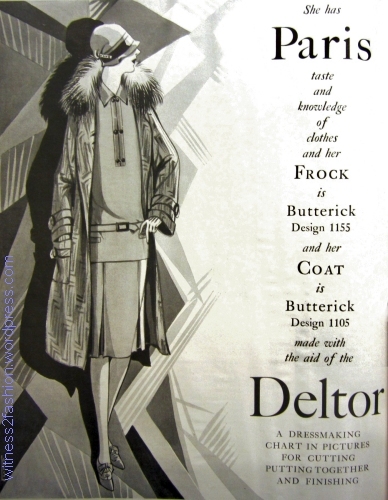 I find surprisingly little sewing information in Butterick’s Delineator magazines from the 1920s, considering that, like McCall’s magazine, it originally existed to sell patterns. That makes this brief article from December 1926 all the more interesting. I’ll transcribe the whole thing, complete with its nasty assumption that all blondes are gold-diggers. “Leila — the little creature without the hat — is a blonde, a Nordic by nature as well as by the color of her hair, but when she couldn’t gold-dig a new frock from her husband she decided to make something dazzling for herself and burst out in one of the new dolman frocks. A dolman blouse, Butterick 1174, with a separate skirt, #6588, and Butterick’s dolman dress pattern 1167. December, 1926. “She had her bust and hip measures taken when she bought her pattern, so she knew the size was right. ‘And that’s that,’ she thought, and cut it out gaily. It went together like a shot and she turned up the lower edges several inches, for, as I said, she’s a little creature. All went merrily as a wedding-bell until she tried it on and then, it was just all wrong. “It was all top and no skirt, the waistline and the dolman armhole came below the hips and the sleeve itself acted very strangely on the lower part of the arm. You see, she’d done all the shortening at the lower edges while the frock was as long for her in the body as it was in the skirt. “I’m on the short side myself, so I knew she ought to have shortened her pattern before she cut her material. We pinned half of the pattern together and put it on with a tape measure at her natural waist. The we put the small perforations that mark the waistline of the pattern at the lower edge of the tape measure and took up the extra length in a plait across the body of the pattern, making it just the right length. We “took up the extra length in a plait across the body of the pattern” just below the natural waist. The sleeve is shortened below the elbow, not at the wrist. “Very tricky, for it kept the waistline in place and gave the body and skirt an even break. “We took the extra length out of the sleeve below the elbow instead of at the wrist, so that the dolman drapery wouldn’t come down on the lower arm where it is clumsy and ungainly. “Trying on the pinned-up paper pattern is the easiest way to find out if the length needs altering — the pattern directions will tell you where to do it. Before and after correct pattern alteration. 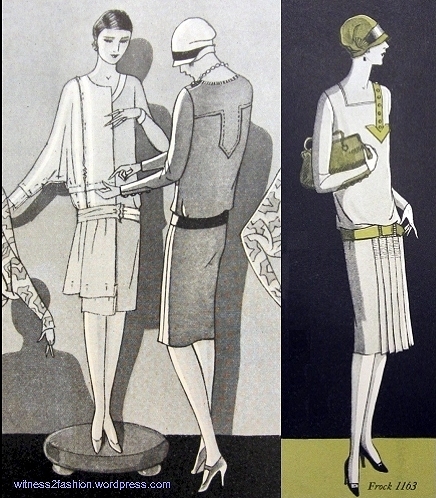 Delineator, December 1926. The skirt, which was originally pinned up several inches, is now at the length called for in the pattern. Good thing Leila didn’t cut it shorter before consulting her friend! 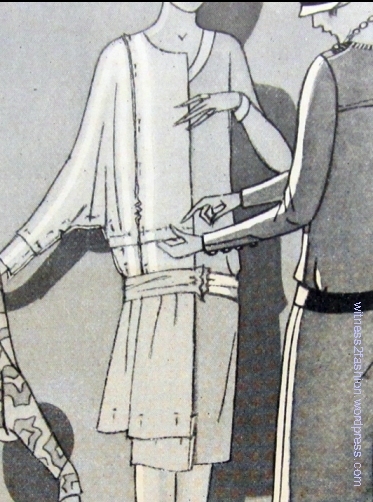 Normally, I don’t write two consecutive posts about the same year and issue of a magazine, but The Delineator for December 1926 has both this discussion of the importance of adjusting the dress to the actual, not ideal, body, and another connection to “Pleated Dresses from 1926.” The friend who is helping Leila adjust her pattern is wearing that great art deco dress, Butterick 1163! I was sorry that I had no back views of it; while working on these pictures I remembered that its description mentioned “a tab yoke in back.” Here it is! On her left shoulder you can just make out the start of the button-trimmed arrow on the front of #1163, and her sleeves have the identical buttoned trim at the wrists. 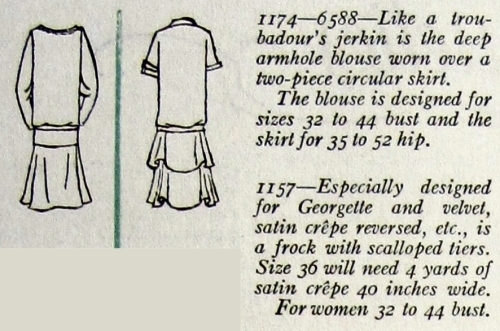 The back of Butterick 1163, with “tab yoke,”and its front view, from elsewhere in the same issue. Dec. 1926. 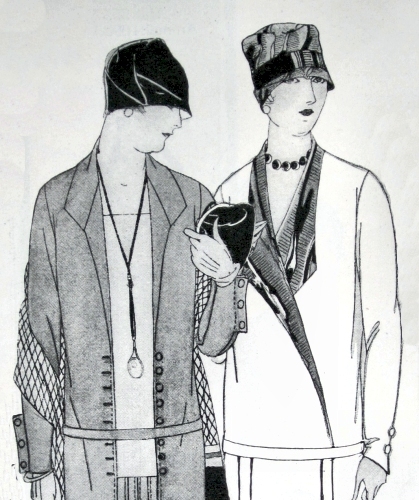 In the early twenties, dresses often had surprisingly boring one-piece backs; the skirt godets, drapery and pleats were usually limited to the front. P.S. If I had to come up with a sophisticated 1920s outfit in a hurry, that metallic [tissue lamé? ] blouse #1174 and its timeless flared skirt would look very tempting. 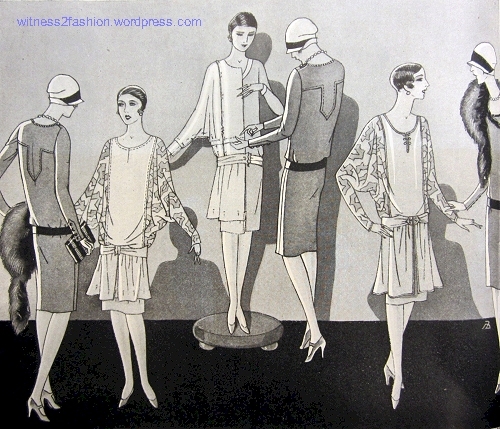 In Part 1, I showed some Delineator pattern illustrations for Misses and Women’s dresses for September, 1926. The same issue had a second article about the importance of pleats [called plaits] — this time for larger women. 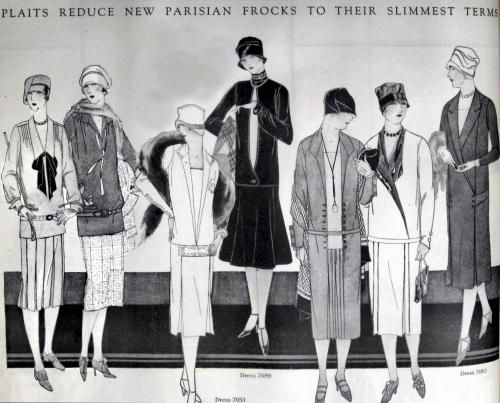 “Plaits Reduce New Parisian Frocks to Their Slimmest Terms.” Delineator magazine, Sept. 1926. 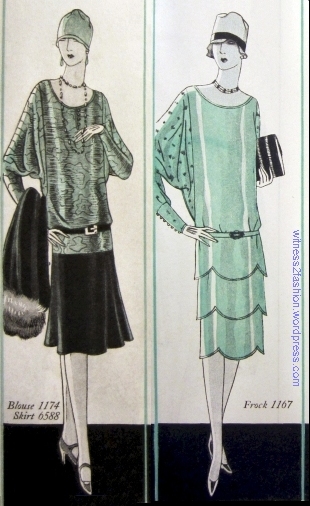 All but one of these Butterick patterns from 1926 is meant for larger-than-average women. 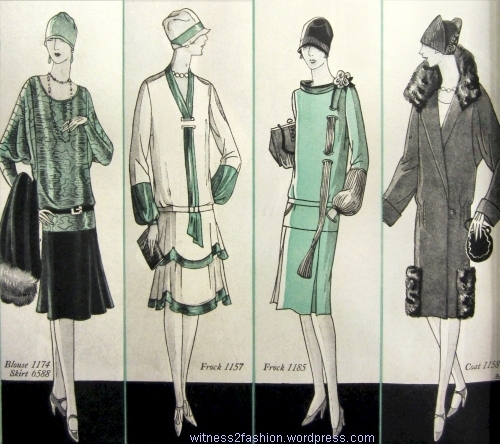 The three on the right are for women with bust measurements from 36 to 52 inches, far from the boyish figure associated with 1920s styles. The four on the left are drawn, as usual, as they might look on women at the smallest end of their size range, not size 46. 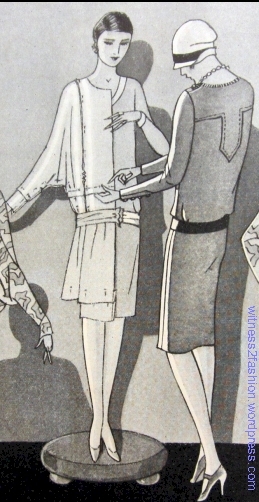 “Slimming” Butterick patterns 7066 (blouse), 6286 (skirt), 7078 (blouse), 6331 (skirt) from September 1926. Delineator magazine. The blouse patterns are new, but the skirt patterns’ numbers show that they first appeared in the previous year. 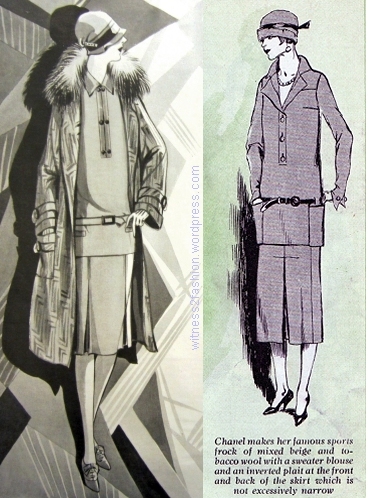 The pleated skirt on the left came in hip sizes 35 to 49.5 inches. Skirt 6331 was available up to hip size 52 inches — equivalent to a modern size 28W. 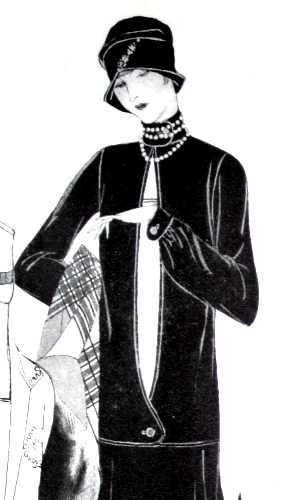 Most early twenties dresses had straight backs, with any flare or fullness in the front only, like skirt 6286, but that was changing by 1926. 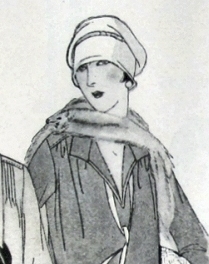 Many mid-twenties illustrations show a decorative colored hankie peeking out from a pocket, like these. 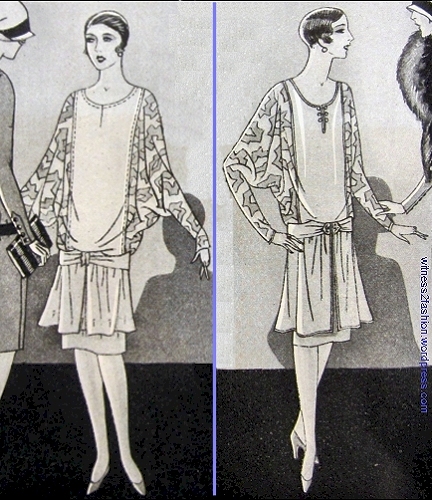 Blouse patterns 7066 and 7078. September 1926. That narrow ribbon tie on # 7078 is slenderizing. These blouses were available for bust sizes 32 to 46, a little larger than the normal size range. They both have yokes with gathers or tucks adding fullness in front, unlike this similar design for Misses aged 15 to 20 “and small women,” which has no bust fullness. Butterick pattern No. 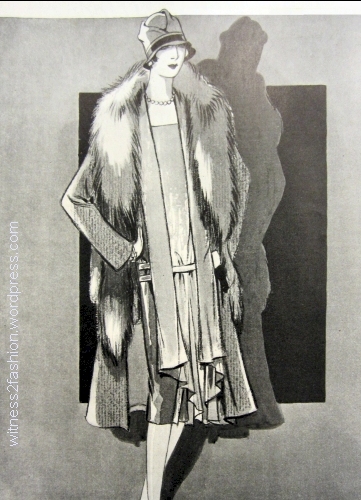 7950 for Misses and small women, Sept. 1926. Butterick pattern No. 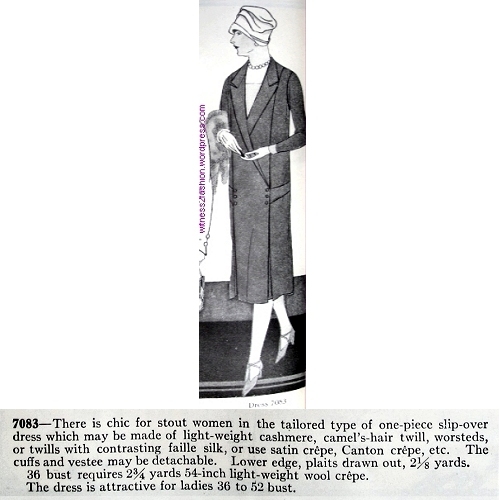 7051 for larger women, 1926. This dress was available up to bust size 48; whether the embroidered horizontal band across the front — widened further with decorative buttons — would be becoming to its wearer is questionable. 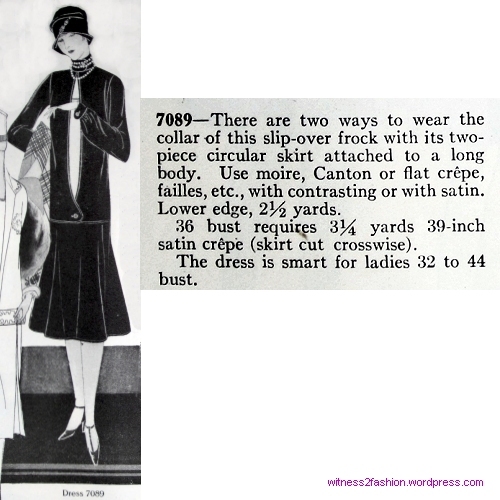 The bodice insert giving the impression of an exposed slip is a “vestee” which could be removed for laundering. It could also be made of a contrasting fabric, like pattern 7089, below. 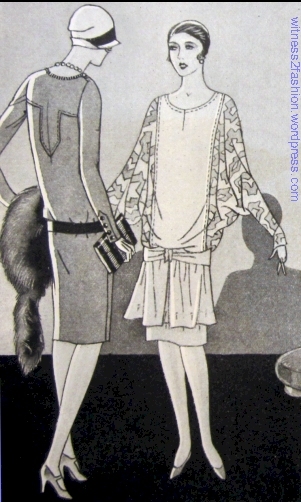 She wears a fairly lavish fox fur stole; even the woman wearing sporty blouse #7078 has put a pair of dead animals around her throat. My mother (the former flapper) was very proud of her fur stole, which had baleful glass eyes and a hinged clip under the jaw, so that the little critters, like this one, appeared to be biting each other. Butterick No. 7089, Sept. 1926. This dress, with a high collar that can be worn buttoned as shown, or open like No. 7051, features a long opening in the center front. Butterick made this dress pattern in its usual range of sizes, bust 32 to 44 inches, roughly equivalent to modern pattern sizes 10 through 22. Her hat is trimmed with a very long jeweled pin. 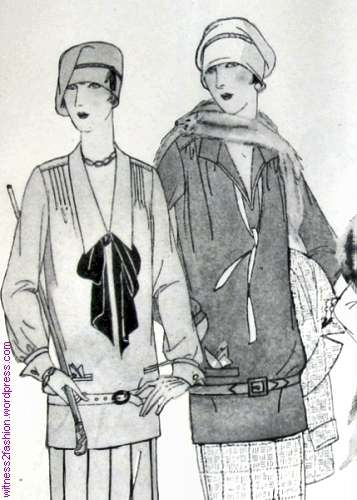 These two patterns were not only available in large sizes, but were described as able “to thin down a stout figure” and “to make the least of a large figure.” I wouldn’t agree about the one on the right. Butterick patterns 7077 and 7046 for bust sizes 36 to 52. Sept. 1926. Number 7077 certainly does its best to create a long vertical area from neck to hem, drawing our eyes to the center, rather than the outline, of the body. Number 7016 has a diagonal “surplice” line intended to do the same, but the hip band and wide space between two sets of front pleats negates the effect. The top of the dress doesn’t really relate to the lower part. 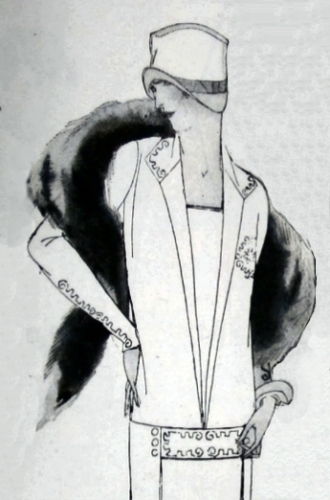 The evening gown below, also from 1926, came in sizes 36 to 48; here, the surplice line is effectively carried down into a side drape so your eye travels past the hip, rather than across it. Butterick pattern No. 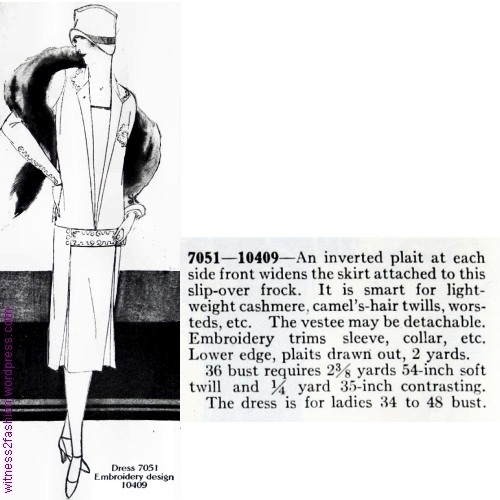 1187 from Dec. 1926 had “reducing properties” and came in sizes 36 to 48. 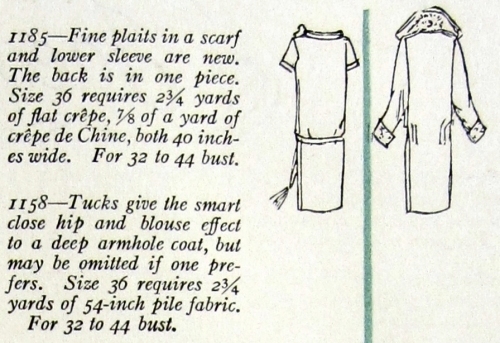 Butterick 7077 and 7016, details. 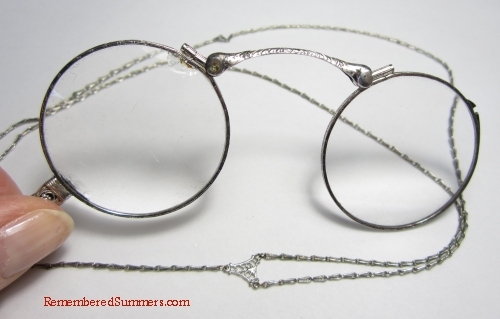 A vintage lorgnette, courtesy of RememberedSummers. 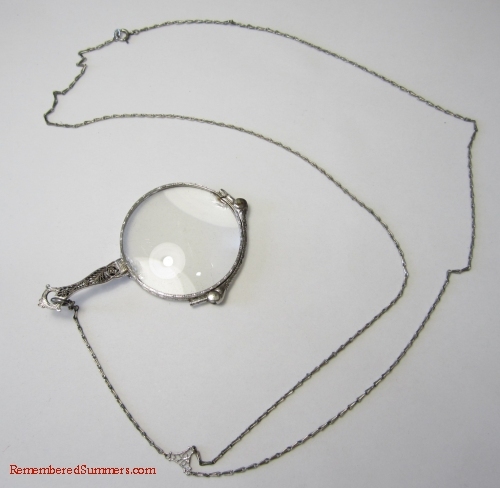 Lorgnette photo courtesy of RememberedSummers. Butterick pattern 7083 is “chic for stout women” with bust sizes up to 52″. Sept. 1926. The image is curved and distorted because it was photographed from a thick, bound periodical volume. In spite of this garment’s princess seams, the model is drawn as if wearing a bust-flattening corset or corselet. 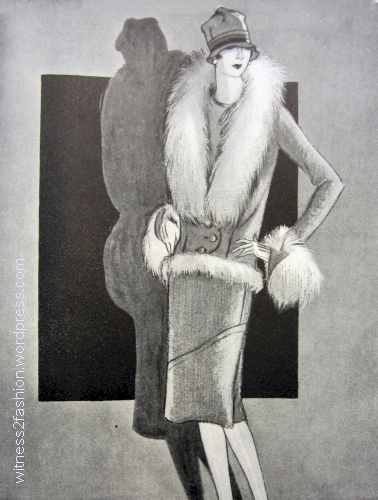 She, too, carries a fox fur piece. 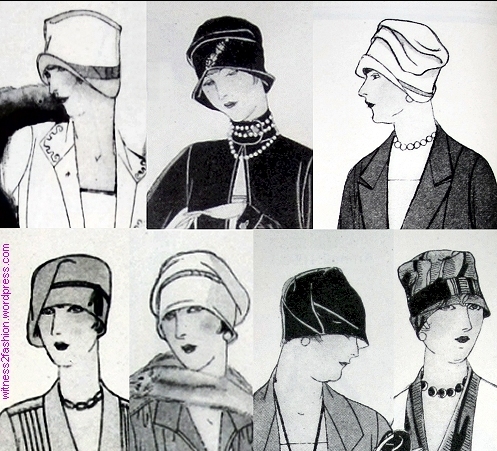 A selection of hats from September, 1926. Delineator magazine. Folds, droopiness, and tiny brims can also be seen in the hats from Part 1. Click here.